I love plants and flowers, and even consider myself a very amateur gardener. But, there is one plant that voraciously grows in my garden that I want to destroy! Yucca plants! These gnarly examples of vegetation are the hardiest, toughest plants I have ever encountered. Weeds are easier to be rid of than Yucca plants. I realize that the Yucca flower is the state flower of New Mexico, and that it has cool names such as Spoonleaf yucca. Filament yucca, and Adam’s Needle yucca. However, I personally think it is just plain Yuk…A . Yucca plants are prevalent in the hot dry areas of the Western United States. They are often planted as ornamental plants and use widely in landscaping. (This must be why my stepfather planted them in the garden.) Supposedly, they are easy to keep and their flowers are unique. I think they are ugly, but that is just me. Moreover, the roots of the Soap tree Yucca were loved and used by Native Americans as shampoo in rituals. So these plants do have a purpose, however, they serve no purpose in my yard other to annoy me to no end. I have cut them, pulled them, beat them, sprayed them but nothing seems to make them go away. I have been told that you must get the entire root system out of the ground or they will come back. So, I have spent countless hours digging below the surface of my garden to accomplish this goal. Nevertheless, the next year they are back. And, it is not just one; there are baby yuccas all over my garden. These things are mutants! I should probably dig them up and sell them on the open market. I hear people actually go to the garden center and ask for these yucky plants! Maybe I am missing out on a real money-making operation. Be it as it may, I have no interest in keeping Yucca plants in my life. Therefore, out they must go once again. I am sure they will be back next year, and I will be ranting about yucky yucca plants for the remainder of my life. They truly are the bane of my existence! 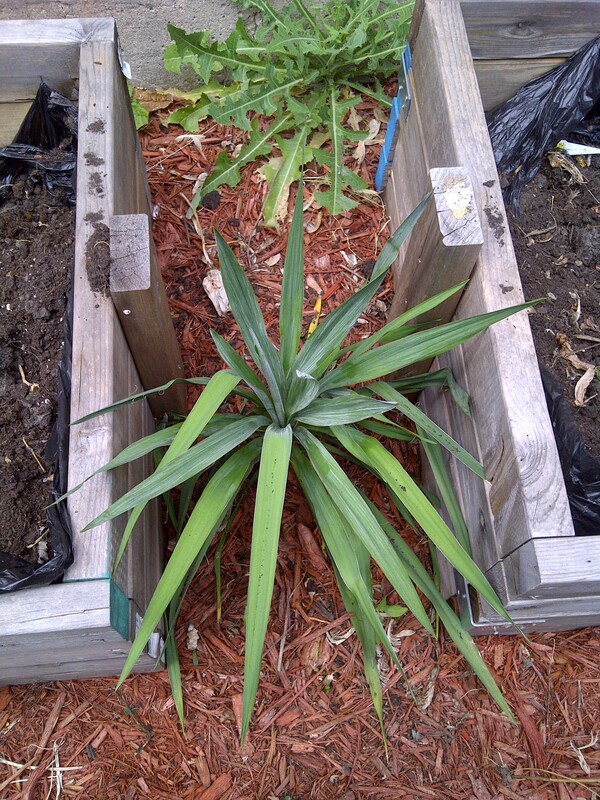 **Here are some places to check out if you wish to remove your Yucca Plants. Some of these sites are not for the faint hearted. Killing the Yucca plant is apparently serious business. Good Luck!! Posted in Living the Life and tagged garden, gardening, Grandmother Musings, Killing Yucca, landscaping plants, nature, plants, postaday, soap tree, state flower of new mexico, yucca flower, yucca plants. Bookmark the permalink. Hahaha – and here I live in the southwest and I don’t have those type of yuccas growing in my yard! I only have one yucca plant – it’s in the back yard and it came with the house, but its the red yucca plant, the kind that has red/pink flowers growing out of it. The leaves are also more string-like. My problem is dandelion weeds – those things are ugly and have pollen that flies everywhere. Bleah!